Queasiness at the sight of blood curtailed Darwin's medical career, so he went to Cambridge to study divinity and join the Church. While there, however, an interest in natural history was sparked. At 22 he heard that a scientific expedition was being organised by a group of scientists planning to travel the world on a ship called the Beagle - a naturalist was needed and Darwin applied and was accepted. They set sail on 27 December 1831. Darwin was influenced by Lyell's Principles of Geology, which suggested that the fossils found in rocks were actually evidence of animals that had lived many thousands, even millions, of years ago. This argument was reinforced in Darwin's own mind by the rich variety of animal life and the geological features he saw during his voyage. Upon reaching South America he observed yet more variety and began pondering the origin of all these species. The clinching evidence for the ideas he was forming came in the Galapagos Islands, home to the Galapagos finches - subjects of some of Darwin's most famous studies. He observed that while they were all undeniably finches, they were also very different from each other.In 1839 Darwin wrote in his book, The Voyage of the Beagle: '...one might really fancy that ... one species had been taken and modified for different ends'. He made similar discoveries with plants. On James Island, for example, he found a total of 71 species of flora, and of these 30 were unique to that island - to the best of his knowledge they existed nowhere else on earth. Back in England in 1836, Darwin tried to solve the riddles of these observations and the puzzle of how species evolve. A famous essay written on population by Thomas Malthus argued that any group of animals would continue to breed until there was insufficient food to feed them all. Darwin realized this was the key. The implication was staggering - as long as there was heredity, variation among the offspring, and limited food, there had to be evolution. Evolution had produced every creature on earth; through showing how an entirely new species could evolve, he formulated his theory that all species had evolved. He worked on this theory for 20 years, until finally kicked into action by a letter from Alfred Russel Wallace, who had come to almost identical conclusions. They published a joint paper, and in 1859 Darwin published his controversial book On the Origin of Species by Means of Natural Selection. 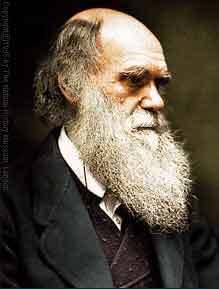 Darwin confessed that he found the writings of Shakespeare, 'so intolerably dull that they nauseate me'. In his youth, he delighted in unusual food. He sampled owl, puma and giant tortoise. He was born on the same day as Abraham Lincoln (12 February 1809). Darwin's wife Emma was a very good pianist, taught by the composer Chopin. Darwin was the great-uncle of composer Ralph Vaughan Williams.